Artificial Intelligence (AI) has been a hot topic for debate for several years, but at the conference IBM Think 2019 In San Francisco (state of California), the technology itself was the one that discussed. 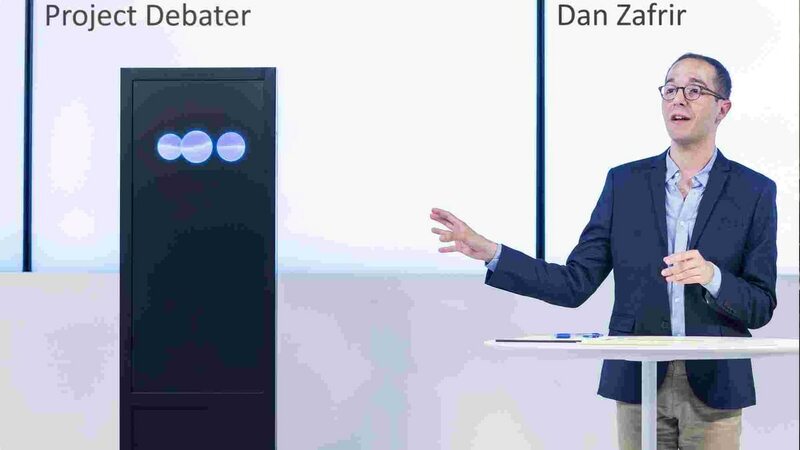 IBM Project Debater, the first systematic intelligence system (AI) that can debate with people about complex problems, faces its opponent of greater caliber Monday February 11 at the Yerba Buena Center for the Arts. The opponent of Project Debater was the Grand Finalist in the 2016 World Debate Championship and 2012 European Debate Champion, Harish Natarajan. Neither of them were prepared in advance for the subject of the debate, on if daycare should be subsidized. Each party had only 15 minutes to prepare their arguments for and against a particular thesis. To defeat Natarajan, the system must gather relevant facts and opinions, give them form with structured arguments, and then communicate their ideas clearly and convincingly. "It is difficult to prepare for a debate against an opponent that the little one is known, but I imagine that Project Debater will be a challenge"said Natarajan, waiting for the contest. "From chess, to Go, to Jeopardy, to StarCraft – the man against the machine challenges has ended with the machine's victory." The debate was divided between a first statement of four minutes, a contradiction of equal length and a summary of two minutes. John Donvan, Four-time Emmy Award winner and host of the debate series Intelligence Squared U.S., moderated session. After the debate, Harish Natarajan was declared the winner of the audience. But Project debates He voted for him to learn more from the responses from artificial intelligence. The knowledge base for Project Debates consists of about 10,000 million phrases from newspapers and academic publications. In the development program since 2012, IBM's next major milestone in AI, after previous advances like Deep Blue (1996/1997) and Watson in Jeopardy! (2011). The purpose of the researchers responsible for the project is to build a system that helps people make informed decisions when the answers are not black or white. The first live debate on project debates was held in June last year before a small audience against the Israeli masters Noa Ovadia and Dan Zafrir. Against Ovadia, the machine must argue for state subsidies for space research. "Subsidizing space exploration is like investing in really good tires"Argued the 1.5-meter-high monolithic machine that would enrich the human mind, inspire the youngest and be a" very solid investment, "he said, making it even more important than public roads, schools or health services. Ovadia was considered the winner of the debate by the many journalists who witnessed the event. The IBM computer had a better performance in the second debate against Zafrir, this time arguing for the benefits of telemedicine. The machine cited sources, pleased the audience and even threw some jokes in the process. Generally, the audience felt that man was better at communicating the argument, but the computer came out decisively in the category "knowledge enrichment". At least nine members of the audience changed their opinion on the subject of the computer's point of view. "People tend to be better at using more expressive language, a more original languagesays Darío Gil, director of IBM Research. "They bring their own personal experience as a way of illustrating the score. The machine does not live in the real world or has a life that can benefit from it". Unlike machines like Watson, IBM says it breaks new ground by creating a system that addresses deeper human methods such as rhetoric and theoretical analysis. "If you are thinking about it, the rules of the debate are much more ambiguous than the rules of a board game", said Ranit Aharonov, who leads the project. "The discussion is probably more complicated for a machine than any of these games," the European champion Natarajan agreed in an article published on Sunday. "In its core, the debate has succeeded three parts. First, a debate handler must process large amounts of information and construct relevant arguments. Secondly, the debate consists of explaining complicated arguments in a clear and structured way. Third, it is necessary to make these arguments important to the audience. This requires careful use of language, emotions, rhetoric and concrete examples of real life. While a machine must excel in the first, the last two can be a challenge. But I am sure it will soon be a point where AI will be better than people in all three cases"added the opponent's opponents.